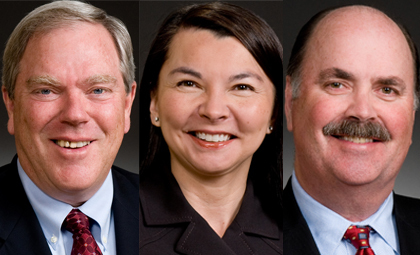 DENVER: In a rare trifecta, all three of Wheeler Trigg O’Donnell’s executive management partners tried and won defense lawsuits in November 2015. The verdicts, issued within 11 business days of each other, cap another successful year for the Denver-based civil litigation firm. 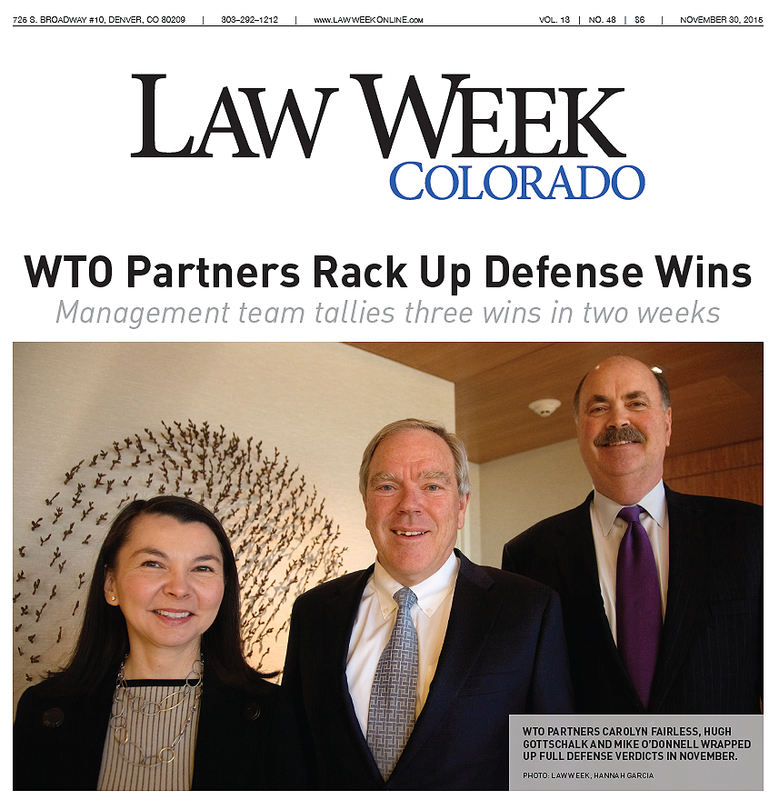 Law Week Colorado reported the wins in its November 30 issue. The three cases involved an oil and gas company facing $1 billion in alleged trade secrets damages, a beverage distributor sued for a traumatic brain injury claim, and a tire manufacturer defending a $20 million product liability allegation. WTO won complete defense verdicts in all three. On November 5, WTO President Hugh Gottschalk won a directed verdict for Noble Energy. A competitor alleged that Noble stole geological data resulting in the improper acquisition of several hundred thousand acres of oil and gas leases in northern Nevada. The plaintiff’s expert opined the plaintiff suffered more than $1 billion in damages. The Denver District Court judge hearing the case granted a directed verdict motion in a civil case for the first time in his nine-year career. Less than a week later, WTO Managing Partner Carolyn Fairless won a jury verdict for Pepsi Bottling Group in a personal injury trial. The 67-year-old plaintiff was struck in the head and shoulder when one or more 20-pound cases of soda fell from several feet above her. The jury ultimately assigned no blame to WTO’s client and awarded only a fraction of the demanded damages against another defendant. On the same day Fairless picked a jury to begin the trial, she rushed to the Colorado Supreme Court in the afternoon to deliver oral arguments in an unrelated appeal. Also in November, WTO Chairman Michael O’Donnell defended Michelin North America in a product liability lawsuit in Arizona. The plaintiff alleged that a Michelin-made tire detreaded at highway speeds, causing a rollover accident that left her hanging upside down in her seat for over an hour and resulted in serious injuries. The plaintiff sought $20 million in compensatory and punitive damages. On November 19, the jury unanimously agreed that Michelin bore no fault in the accident. Through the first 11 months of 2015, WTO has won 11 trials, 9 appeals, and 5 evidentiary hearings. Since 2010, Wheeler Trigg O’Donnell lawyers have won 43 complex trials and 32 significant appeals nationwide. WTO represents sophisticated clients in high-stakes civil trials, appeals, arbitrations, and related matters, including class actions, mass torts, and multidistrict litigation. The Denver-based firm was established in 1998 and today numbers 100 lawyers. Won a directed verdict in a trade secrets trial for an oil and gas company. The plaintiff claimed theft of its technical geological data that allegedly had allowed the defendant to improperly acquire several hundred thousand acres of oil and gas leases in northeastern Nevada. The plaintiff's expert opined that the misappropriation of the trade secrets had caused more than $1 billion dollars in damages.